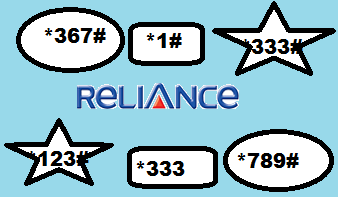 Reliance all USSD codes to check balance, offer, plan, alert etc. USSD is an acronym of Unstructured Supplementary Service Data, is a protocol. Reliance Communication (RCOM) is an Indian telecommunication company. This post will give you all USSD codes and also the way to get SMS alerts, to find balance, offer, plan and alert of Reliance. You can also see for Apn setting of Reliance if you are facing problem in setting APN in android mobile and access to internet. Here are the list of codes. Looking for Activating roaming free for one day in Reliance. Check reliance 4G jio plans, offers and USSD code. Take talk time loan balance in Reliance. How to take talktime loan balance in Reliance. experience of using Reliance USSD code services. I want to know the USSD code to check the SMS BALANCE on post paid RIM connection for CORPORATE PLAN. how can i activate one day internet pack in reliance??. A special Rs.9 Menu where you get 1GB internet for 1 Day, balance deducted from main balance. + there is a trick too. If you have any internet packs activated 1GB will be added to the current Mb balance and it won’t expire in 1 day. For eg if you have 30days internet pack activated then you activate the Rs.9 pack, you get a extra 1Gb added to the current GPRS balance, and it will be valid for the whole 30 days. If you need more data activate the Rs.9 GPRS pack again. how to activite our mobile data for sim aircel and reliance plz me. Sir, I want know the code of 35 all local tarrif plan…what’s it code.plz reply on my email id. which code have to dial to get 1000 rs free talk time? I couldn’t activated 3G network on my mobile, so you activate 3G network on my mobile or write me procedure. what is the right sms balance ussd code. bcoz i tried *367*2# and he saying *367*3# but no result. I want to know the how to check the validity for tarrife plan. Do you Data balance SMS alert Relince. Code for std call minutes. Does rs 9 -1gb 2g still activate in harayana?? how to know my mobile number offers (like full talk time offers) and how to activate DND service. I have checked offer at *129# in option 3 i.e. Paisa wasool offer and the offer was at the recharge of ₹102 you get 102 balance 1Gb internet 25p/min tarrif for 28 days. Then i just go to my nearest reliance store and recharge the same but i found that the benifit is only valid for 3 days i get 102 talk value and tarrif of 30p/min and 2gb internet but it still valid for 3 days only and i can’t consume it in 3 days its total waste of my money. According to plan the given benifit is totally different.